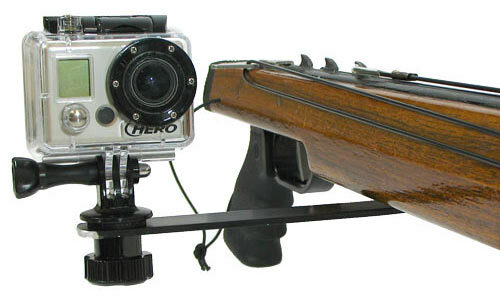 THE ONLY SPEARGUN CAMERA BRACKET WITH A QUICK RELEASE SO YOU CAN VIDEO TAPE YOUR BUDDY WITHOUT POINTING YOUR SPEARGUN AT HIM. Your buddy just lined up on _the_ shot of the dive trip. 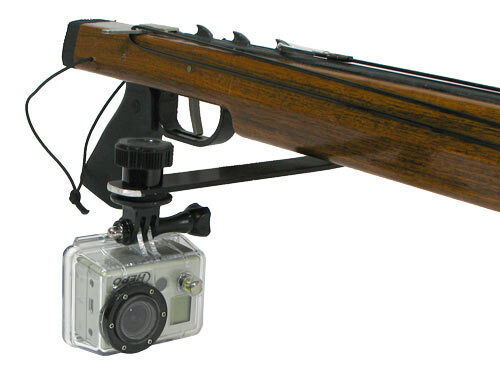 But your gopro is mounted to your loaded speargun. You know it's critically important to never point your speargun towards your buddy. And now theres no video of that amazing stone shot. I've been in this exact situation and thats why I created my unique quick release feature that lets you remove the gopro from your speargun to safely capture all the action. You'll never never miss the action and you'll never point your speargun towards your dive buddy with the MAKO Spearguns GoPro camera mounting system. The Quick Release lets you switch from “GUN MOUNTED” to “HANDHELD” then back to “GUN MOUNTED” in less than 5 seconds (NO TOOLS REQUIRED). 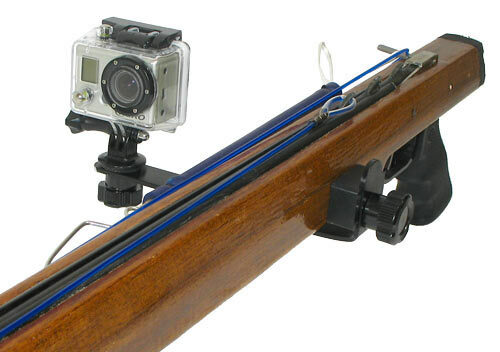 The MAKO posi-lock modular design ensures the camera is always put back on the speargun in the exact same position every time (in seconds and without looking). Eliminates having to constantly install screws and remove screws from your wood stock. Just leave the low profile mounting base plate in place when not using your camera. Never point a loaded or unloaded speargun at any body or anything you don’t intend to shoot. With the MAKO Spearguns Quick Release Camera Mounting System, you can video or photograph targeted species while in speargun mount mode and also video or photograph non targeted species as well as dive buddies safely and easily in hand held mode. Installing the MAKO Spearguns Camera Mounting System is simple & quick. 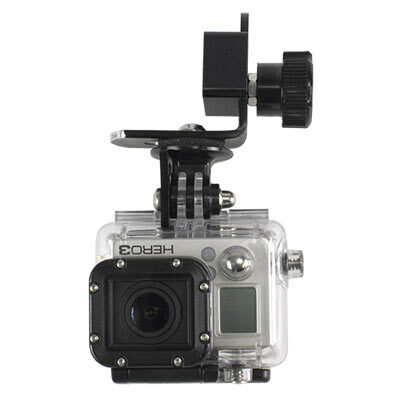 For use with GoPro cameras and non GoPro cameras that have a standard tripod mount. Camera arm comes pre machined for “side mounting” on left or right side of speargun. Kelp divers choose the "In-Line Arm" for effortless diving in kelp. Camera arm can be removed and re-installed in seconds to make videoing or photographing your buddy fast and easy and SAFE!!! Use the “in-line arm” so your camera does not get hung up on the kelp. The In-Line arm tucks your GoPro right in line with the speargun barrel letting you glide effortlessly through the kelp. Low Profile Mounting Base Plate: This low profile base plate is mounted to your speargun using the 3 supplied stainless steel screws. It has a machined “posi lock” channel to easily accept the camera arm which fastens using the ¼-20 control knob. 2 Control Knobs: One of the ¼-20 “control knob” fastens the “camera arm” to the “base plate”. Just a couple of turns releases the arm for quick removal and a couple of turns re-connects the arm for rapid re-installation. The other “Control Knob” fastens the camera to the GoPro Tripod Mount (due to clearance considerations, this control knob is replaced with a stainless steel screw in the in-line mount configuration. Stainless Steel Screws: For mounting the “Low Profile Base Plate” to speargun stock. Neoprene Washer: Ensures a tight fit. Tripod Mount for GoPro: Connects the Arm to the GoPro housing. Most spearguns with any power at all will have some recoil. The GoPro thumb screw housing clamp often can't be cranked down tight enough to prevent your GoPro from tilting tilting forward and down upon firing. The optional Recoil Stabilizer solves that issue by installing the stabilizer at the housing mount and replacing the GoPro knob with our longer screw. Just tighten the screw and the HERO 3 housing is locked in place. Quality mount and got some great video with it! My only recommendation would be to be careful with the rubber grommet if you take off the camera from the mount to film a buddy, the grommet floats away since it's not attached. Other than that it's an awesome mount! Thanks for the fast shipping! Excellent product. Easy to install, worked flawlessly. Definitely recommend the extra piece to keep the camera from kicking when you take a shot. In order for it to release it only leaves a couple threads on the screw that holds the mount to gun. My screw fell out on the first dive when I tried to film my buddy and the mount was useless the rest of the trip. In addition the thread on the screw is a different thread then other GoPro accessories so there was no replacing it in the moddle of the ocean. I've been using the mount since 2012 and it is absolutely amazing, very quick and easy to remove and put back into place. I have tried other kinds of mounts but this is by far the best one. Highly recomended. 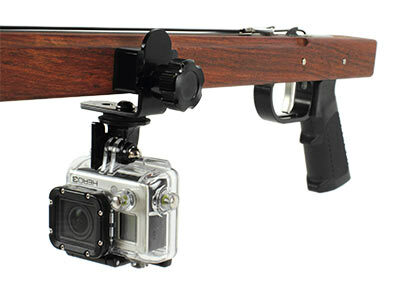 Having tried many types of GoPro mounts for my speargun, this so far is the BEST one I've used.